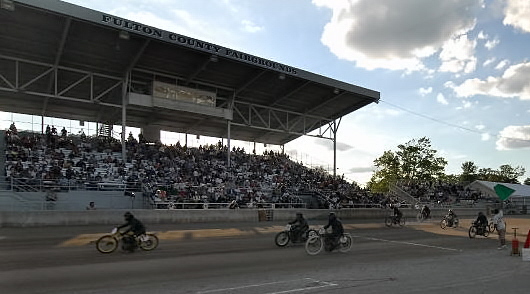 The ½ mile limestone cushion track was in shape to start racing on Friday despite being saturated for weeks, coupled with Thursday night's showers that stopped sometime around 9:00 am Friday morning. Hot laps started on time followed by 28 heat races. On race 30 of the semi finals, a storm blew in with a wall of rain. When the storm passed, an additional thirty minutes were given to monitor the standing water on the race surface. Officials called the race because of unacceptable track conditions due to inclement weather, and were unable to run the ten final races. The meet was 75% finished, and the program was deemed complete, with full purse and awards paid to the riders based on their finishes. * Should a meet be stopped with over 50% (60% in Short Track) of the entire program completed by the leader, the program may be considered complete and the entire guaranteed purse will be paid. 2:15 pm Practice by class order posted in the pits. 4:30-5:45pm Heat races will start, same order as practice schedule. Be ready to race. Wristbands: Your wristband is your event ticket/pit pass and must be worn at all times. If you leave the facility, you must have it on to re-enter. This is your gate ticket. Please do not take it off. 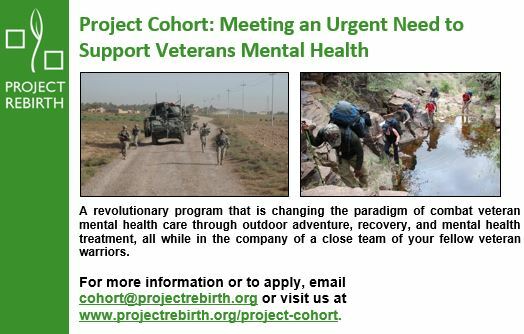 Pre-Entry Deadline: June 12, 2015 (postmarked) Sorry no refunds or cancellations. 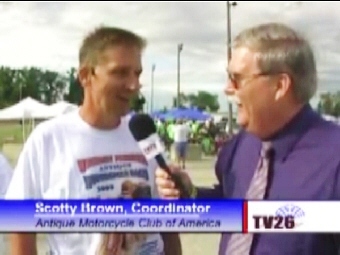 Bike Days LLC reserves the right to accept or reject any and all race entries. The race pre-entry is not a pit pass. 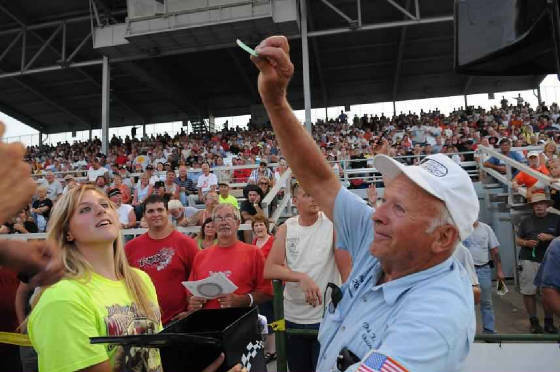 Riders and crew will continue to purchase pit passes at the pit gate entrance upon arriving at the fairgrounds. Pre-Registered Riders are required to “check in” at the Bike Days Rider Registration trailer between 10:00 am and 1:30 pm. Event T-Shirts: Each rider that pre-registers by June 12, 2015 (postmarked) will receive one FREE Bike Days t-shirt. Please remember to indicate your t-shirt size (*Adult small, medium, large and extra large only). Please enclose $5.00 extra for size 2XL. Additional t-shirts may be purchased in the pit area. Release of Liability: You are responsible for your own safety. All persons entering the pit area must sign the liability release waiver. Parents or legal guardians must sign the release for children under 18 years of age. Pit Area for “direct drive” motorcycles. There will be a specific pit area assigned for Speedway and Board Track. Signs will designate area. Number Plates: Number plates must be located on the front and left side of the bike. Numbers must contrast with color of plate (example: white plate with dark numbers). Please make sure they are readable so the scorekeepers can score your number correctly. If you do not have a readable number on the front and left side, you will not be scored. Duplicate numbers in a class will be asked to add an extra number or letter to their plate. All classes of motorcycles must have working handlebar mounted kill switch. Please baffle open exhaust. Awards – Checkered flag to first place winners and plaques awarded to second and third place. NO Pit Racing. - 5 mph only in the pits. Camping - Racers and crew are permitted to camp overnight in their pit area. No water or electric hook-ups. No campfires. Prohibited: fireworks, firearms and glass containers. Food Concessions – Available in the pit area. 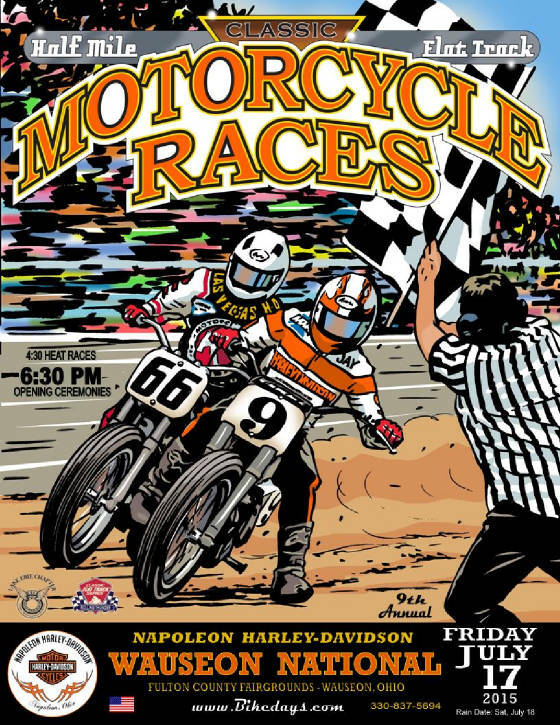 Christian Flat Track Ministries (CFTM) - Adam Phillips (CFTNCS) and Bill Goebel (Wauseon National). 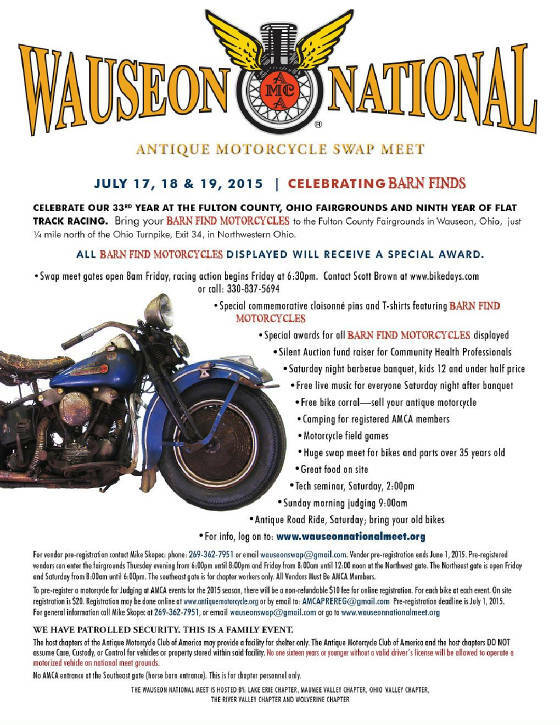 The Wauseon National Meet is hosted by: Lake Erie Chapter, Maumee Valley Chapter, Ohio Valley Chapter and the River Valley Chapter. General Information is located at Rider Registration. Lost & Found is located at Rider Registration. 4. Wheels & Tires: 28 x 2 1/4 ribbed racing tires on clincher rims or 28 x 3 tires on clincher rims or 21 x 3 Avon-style ribben Speedmaster tires on 21 inch drop-center rims. Button tread or Non-Skid clincher tires can also be used. 1. Rear brakes required – no front brakes. 2. Years of bikes are 1948-1966 Harley-Davidson. 4. Stock frames from 1948-1966 hard tail or swing arm frame. Frame may be braced for extra support. 5. You must use stock cylinders 1948-1966, but may alter intake and exhaust ports. 6. Must run stock gas tank. 7. No reed valves intake. 8. You may change the head, carburetor, exhaust pipes, wheels, handle bars, seat and front end. 1. No brakes, no aftermarket swing arm frames. 2. 250cc short track and ½ mile machines. 3. Engines produced 1967 model year and before (examples: Triumph Cub, BSA C-15, Honda Hawk, Bultaco Metisse). 4. Aftermarket rigid frames such as cates and sonic weld may be used. 2. Foot shift and hand clutch. 3. 750cc side valve, 500cc overhead valve. 2. Air cooled engines singles or twins. 3. Two stroke or four stroke motors. 4. Carburetor size maximum - 36mm on 4stroke and 40mm on 2stroke. 2. Honda Ascot’s are legal. 3. Must be a twin shock frame. 3. 42 mm forks are legal. 3. 19”or 22” rear wheel legal. 4. Single or 2-speed trans. legal. 5. Speedway or Long Track chassis legal. The Board Track class (teens through 1928) take to the track at Wauseon. Start of the 500 Brakeless Final in Wauseon. helps out with the raffle and pulls the winning ticket. 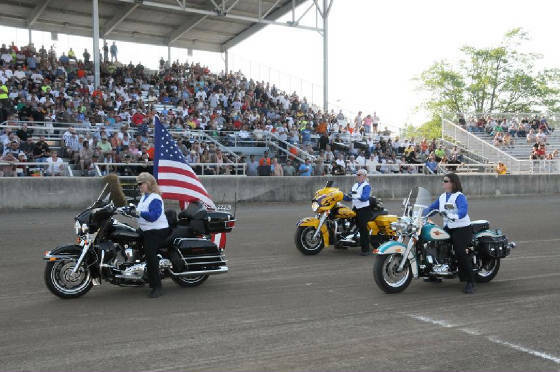 The Motor Maids Parade Lap during Opening Ceremonies.